Noise control curtains for: punch presses; HVAC chillers; boiler feed-water pumps and shaker test stands. Call us at (215) 295-7700 or fill out our contact form. An international consumer products company had to reduce equipment noise in the adjacent aisle. 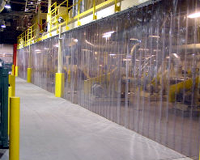 Quick access at any point along the barrier was solved with this clear strip curtain. The noise was reduced to the company’s noise standard level. A major utility converted a former outdoor garden area to be used for a Customer Service Center. All of the hard, reflective surfaces made telephone conversation almost impossible. 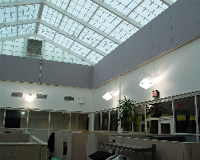 The reverberation was resolved with these attractive acoustical panels that were installed around the perimeter of the room just below the glass roof.